A Health Savings Account (HSA) can be a powerful tool to cover your current and future out-of-pocket health care expenses. You have the choice to keep your HSA funds in your cash account which can earn interest similar to a savings account, or you can leverage the investment option in your HSA to take advantage of the opportunity for higher growth on your earnings with a variety of mutual funds available to you. Start small if you need to. With a minimum balance of $1,000, you can begin investing in your HSA. If cash flow is a concern, take a minute to think about your everyday spending habits. For example, let’s say you buy a bottle of water and a cup of coffee six times a week. 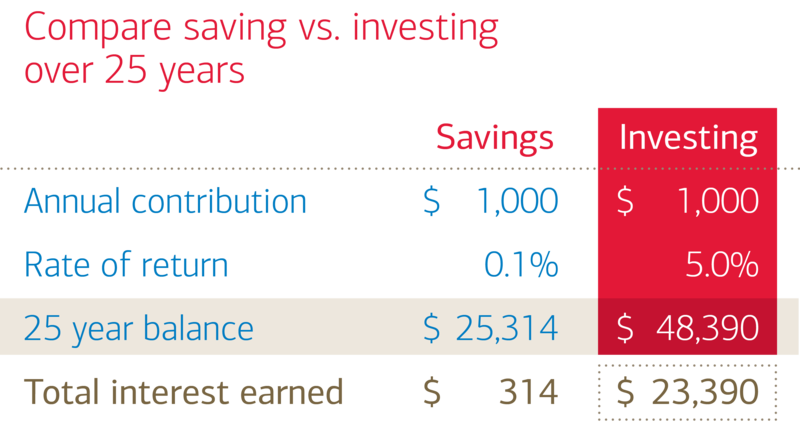 If you save the same amount of money into your HSA, after one year you’ll have over $1,0002. Even a little can add up, and it’s okay to start small. Diversify. Following a diversified approach* is a wise choice. You can invest your HSA in a broad selection of mutual funds. Depending upon your tolerance for risk and timeframe until retirement you’ll be able to choose from options that align with your long term investment strategy. *Diversification does not ensure profit or guarantee against loss. It’s easy to manage your funds, plus get cash if you need it. You can watch this short video to see how easy is it to set up your investments. Once you set up your investment account, you will be able to manage it easily on the member website. And remember, if you need cash to pay for current medical expenses, you can get it. Stay informed. There are plenty of resources to learn more about investing your HSA, including many here on this site or on the member website. The more you learn, the more confident you will feel that you have a strategy in place to cover your costs when the time comes. 1Source: Employee Benefits Research Institute, December 2017. A 65-year-old couple, both with median drug expenses would need $273,000 to have a 90% chance of having enough money to cover health care expenses (excluding long-term care) in retirement. A 65-year-old man would need $131,000 or a 65-year-old woman would need $147,000 to have to have a 90% chance of having enough money to cover health care expenses (excluding long-term care) in retirement. Savings Needed for Medigap Premiums, Medicare Part B Premiums, Medicare Part D Premiums and Out-of-Pocket Drug Expenses for Retirement at age 65 in 2017. 2Assumes the average cost in 2017 for a bottle of water is $1.00 and cup of coffee costs $2.50. $3.50 six times a week equals $21.00, times 52 weeks a year, equals $1,092. See how your savings can add up to help pay for medical needs now and in the future. Frequently asked questions about investing with an HSA. Take a quick quiz to learn about investing.